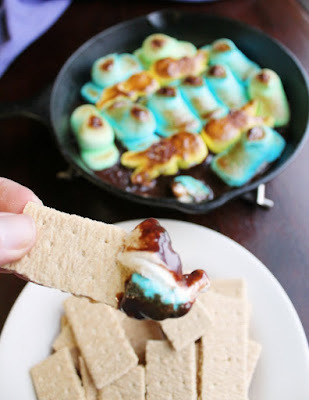 S'mores have never been so cute (or so easy!) The melted chocolate base is covered with fun golden and gooey Peeps marshmallows making a fabulous dip for your graham crackers. Put that Easter candy to good use. This s'mores dip is a super fun way to enjoy it. The melted chocolate base is covered with gooey marshmallow. All you need is some graham crackers to dig in with! This is one everyone is going to love. If you are anything like me, you have a love/hate relationship with Easter candy. At first, like in any new relationship, it is all love. Chocolate eggs and jellybeans, where have you been all my life? I have missed you so. Please come around more often. Then Eater comes and the candy multiplies. Why yes, I will have another peanut butter egg. Thanks for asking! Then by a couple days after Easter, all your favorites are gone. By midweek after Easter I just can't with the candy any more. WHY IS THERE SO MUCH?! How did it get to be everywhere? When will it be gone? For Pete's sake, shorts season is right around the corner. Why have you forsaken me Easter Bunny?! So I did what any person in my predicament would do, brought in reinforcements! Chloe and Pops seemed happy to come see what I was up to. So they played with Little Dude while I melted down some chocolate bars, eggs and kisses, and stirred in a little cream. A nice thick layer of Peeps was arranged on top before taking a quick trip to the oven. A few minutes later, those bunnies were nice and soft with a beautiful tan. Next thing we knew, we were all digging in with animal and graham crackers. Even my husband was impressed! We managed "dispose of" a little more than 2 packages of Peeps, and a fair number of chocolates. We still have a little work left to do, by the Easter candy saga of 2016 is almost over! If you are looking for more fun ways to use up Easter candy, may I suggest Easter egg blondies? They are super easy to whip up and fun to eat as well! In a 8-9" cast iron skillet (or any thick bottom oven safe skillet), melt chocolate and cream over low heat. 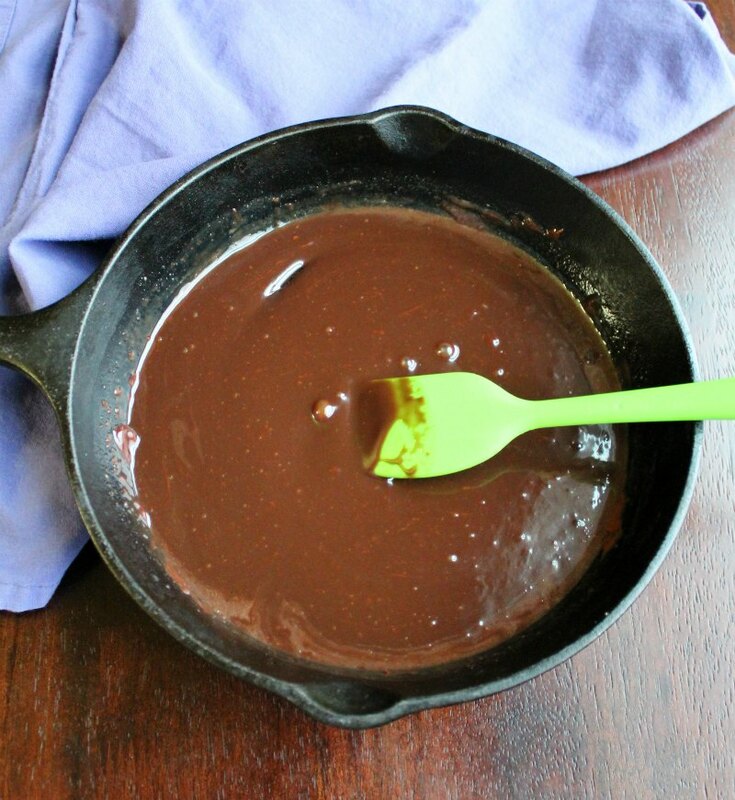 Stir frequently to avoid burning the chocolate and warm until melted and smooth. 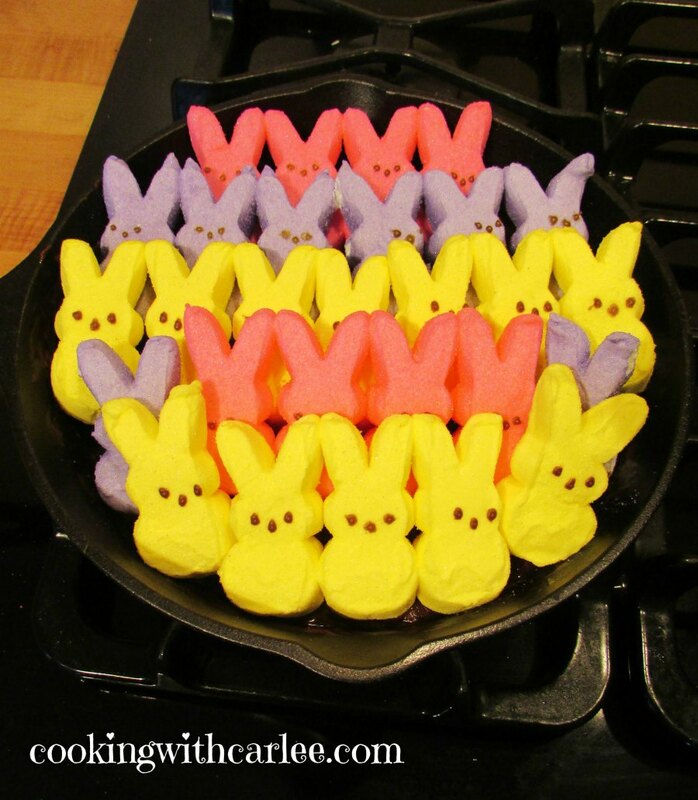 Arrange Peeps over melted chocolate. Place under the broiler set to low until the Peeps are gooey and golden brown. This should take about 5 minutes, but keep a very close eye on it so you don't end up with charred mallows. Unless you're into that sort of thing. Then char away! Carlee, have I mentioned you're brilliant??!!! Toasted them peeps right up and with the addition of chocolate and cream, now they are Peeps Perfect!! Ha! Thanks Andrea! I can't wait to hear all about your weekend trip and your birthday! What a great way to use up Peeps Carlee! Have a nice weekend. You should totally move closer! I'm not a fan of those peeps, but I have to say, this is a great way to use them!! My family would love it! They aren't my favorite either, but it seems like there have to be some around at Easter anyway. Usually my family loves watching them expand in the microwave when making indoor s'mores but this was even more fun than that! What a great idea for Peeps! My sister-in-law had 8 boxes when I dropped in yesterday, now I'm wishing I'd grabbed a few. 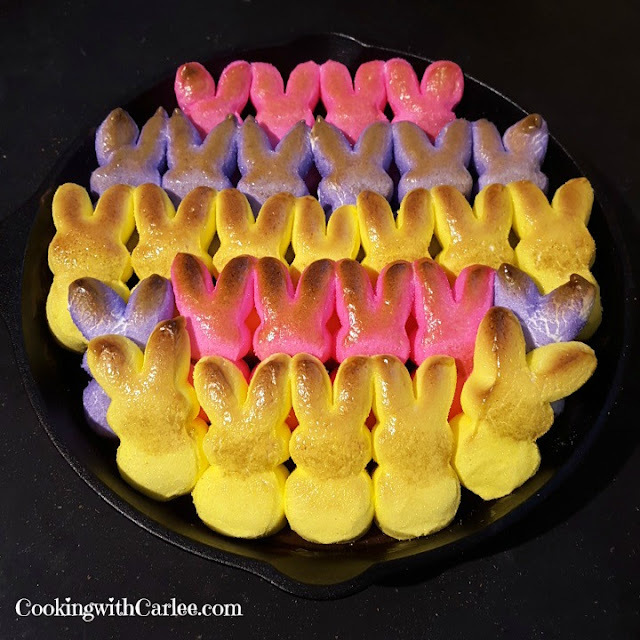 My hubby loves Peeps and S'mores, so this is right up his alley! Aw man, you should have! This is a great way to use some up! 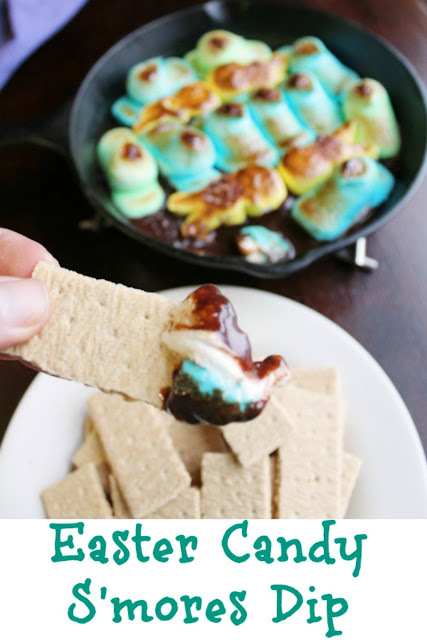 I'm not a huge fan of peeps (or plain marshmallows), but I do LOVE s'mores...this is such a great idea!!! This is a great way to use them since they have a habit of appearing this time of year! Thank you! You torched your peeps! I knew I liked you ;-) Also, there's a small typo up top but I beg you not to change it because it's so appropriate. You called Easter "Eater." Thanks for joining us again at Saucy Saturdays, Carlee. Always love seeing your stuff. Ha, I did! I will leave it just for you as it does seem quite appropriate! Thanks for hosting! Carlee, this is not only looks absolutely delicious, it looks like a lot of fun too. Who could resist those toasted bunnies, they are so colorful and you know they will be gooey, tasty, good. What an original idea, you amaze me each week with your originality. Thank you, Nikki! Peeps are one of those foods that I like better toasty and gooey! Plus it is hard to go wrong with melted chocolate. Oh my gosh, this is too fun!!! I almost wish I had bought too many peeps, but that is never a thing around here, haha. Pinning for next year!! Pinning to my Easter fun board! What is it with the Easter candy? I just can't even eat one more piece of candy either! Well. Maybe I can inhale one more.. Can't wait to try this, Carlee! It looks like a lot of fun! Luckily we are now pretty much done with it. I think there is one more Cadbury Egg downstairs. I think at this point it has become a relic of the holiday that nobody dares destroy ;-) Oh well, it's almost birthday time so a new batch of sweets will take hold soon! We don't have peeps here, but we have similar products. I'm sure the kids would love this. Thanks for sharing with the Blog Fair. I'm sure it will be an instant hit! Thanks!